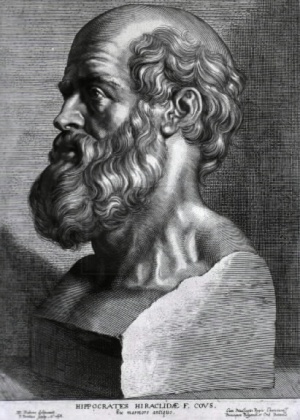 The Hippocratic Oath is an oath traditionally taken by physicians pertaining to the ethical practice of medicine. It is widely believed that the oath was written by Hippocrates, the father of medicine, in the 4th Century B.C., or by one of his students. Although mostly of historical and traditional value, the oath is considered a rite of passage for practitioners of medicine. I swear by Apollo the Physician, Asclepius, Hygeia, and Panacea, and I take to witness all the gods, all the goddesses, to keep according to my ability and my judgement, the following Oath. To consider dear to me as my parents him who taught me this art; to live in common with him and if necessary to share my goods with him; To look upon his children as my own brothers, to teach them this art if they so desire without fee or written promise; to impart to my sons and the sons of the master who taught me and the disciples who have enrolled themselves and have agreed to the rules of the profession, but to these alone the precepts and the instruction. Several parts of the oath have been removed or re-shaped over the years in various countries, schools, and societies as the social, religious, and political importance of medicine has changed. Most schools administer some form of oath, but the great majority no longer use the ancient version, which praised non-Abrahamic deities, advocated teaching of men but not women, and forbade general practitioners from surgery, abortion and euthanasia. Also missing from the ancient Oath and from many modern versions are the complex ethical issues that face the modern physician. To teach medicine to the sons of my teacher. In the past, medical schools would give preferential consideration to the children of physicians. This too has largely disappeared. Not to teach medicine to other people. If taken seriously, a physician who attempts to educate or make aware of treatment options, even online, to anyone not enrolled in medical school would lose his or her license. To practice and prescribe to the best of my ability for the good of my patients, and to try to avoid harming them. This beneficial intention is the purpose of the physician. However, this item is still invoked in discussions of euthanasia. Never to do deliberate harm to anyone for anyone else's interest. Physician organizations in the U.S. and most other countries have strongly denounced physician participation in legal executions. Never to attempt to induce an abortion. This item is still invoked in discussions of abortion. To avoid violating the morals of my community. Many licensing agencies will revoke a physician's license for offending the morals of the community ("moral turpitude"). To avoid attempting to do things that other specialists can do better. The "stones" referred to are kidney stones or bladder stones, removal of which was judged too difficult for physicians, and therefore was left for surgeons (specialists). It is interesting how early the value of specialization was recognized. The range of knowledge and skills needed for the range of human problems has always made it impossible for any single physician to maintain expertise in all areas. This also highlights the different historical origins of the surgeon and the physician. To keep the good of the patient as the highest priority. There may be other conflicting "good purposes," such as community welfare, conserving economic resources, supporting the criminal justice system, or simply making money for the physician or his employer that provide recurring challenges to physicians. To avoid sexual relationships or other inappropriate entanglements with patients and families. The value of avoiding conflicts of interest has never been questioned. A widely used modern version of the traditional oath was penned by Louis Lasagna, former Dean of Tufts Medical School. The Hippocratic Oath has been updated by the Declaration of Geneva. In the United Kingdom, the General Medical Council provides clear modern guidance in the form of its 'Duties of a Doctor' and 'Good Medical Practice' statements. This page was last modified on 30 May 2012, at 13:37. This page has been accessed 9,055 times.